With a surname like his, Victor Moses was always expected to achieve great things. But after overcoming personal tragedy and learning his trade at Crystal Palace, the 21-year-old is playing a crucial role in leading Wigan Athetic out of the mire and ensuring the club maintains its Premier League status. After the astonishing 1-0 victory against Manchester United that breathed fresh life into the title race, Moses heads to the Emirates on Monday evening with Arsene Wenger’s resurgent Arsenal in his sights. A superb run of performances has see Roberto Martinez’s side pick up three wins from their last four – including a 2-1 triumph at Anfield against Liverpool and the unlucky reverse against Chelsea at Stamford Bridge – and have provided the perfect stage for the new Nigeria international to showcase his considerable talent. And he has certainly seized it. “This is not a daunting run of games as playing these teams is what every footballer dreams about,” Moses told The Sun in an interview before the meetings with Chelsea and Manchester United last week. Given the journey he has taken, that is no surprise. Little more than a decade has passed since Moses arrived in the UK after both his parents were murdered in religious riots in Kaduna. Both were Christian missionaries and were targeted by Islamic extremists because his father Austin had run his own church in the village Moses grew up in. The story goes that the young Victor was playing football with friends when his uncle told him both his parents had been killed. Fearing for his safety, the 11-year-old was hidden at a friend’s house for a week while his family arranged to send him to relatives living in south London. Three years later, Moses was spotted in a Croydon park by Palace scouts and was invited to join their youth team. They also arranged for him to attend a prestigious public school called Whitgift, where he inspired the headline ‘Moses parts the red sea’ after scoring all five goals in a national cup final. Call-ups for England youth teams soon followed, as did his first-team debut for Palace in November 2007 – aged just 16. Moses helped Neil Warnock’s side reach the Championship play-offs in his first season but administration at the end of 2009 forced the Eagles to sell their best player for a cut-price £2.5 million. Despite offers from Manchester City and West Brom, however, the 19-year-old chose the DW Stadium instead to continue his development under the watchful eye of Martinez. And after taking his time to find his feet at Wigan, this season has seen the tricky attacker emerge as the Latics’ standout performer, having scored four goals and provided six assists. Martinez even went as far as to describe Moses as "our Lionel Messi" earlier in the season, while Arsene Wenger used his pre-match press conference on Friday to single him out as Wigan’s main attacking threat. “Whatever country he ended up in, Victor would have been a footballer. He has that much natural talent,” his agent Tony Finnigan said. But after finally committing himself to the land of his birth, England’s loss may be Nigeria’s gain. 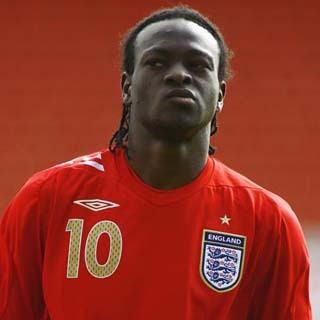 Having worn the Three Lions shirt at several youth levels up to Under-21, Moses had a change of heart when the Super Eagles came calling, eventually making his debut in February’s African Nations Cup qualifier against Rwanda. He has since inspired Wigan to move out of the drop zone thanks to a remarkable sequence of results they will hope to extend at the Emirates on Monday. With only a year left on his contract, that could well be Moses’ last act for the Lancashire club as Dave Whelan faces a familiar battle to keep his best player – regardless of Premier League survival. “When he played for England Under-18s and Under-19s, we had phone calls from Real Madrid and Barcelona scouts so people know all about Victor,” admitted Finnigan. For now, though, Moses’ only objective is to ensure Wigan extend their stay in England’s top flight into an eighth season. After that, Whelan may just have to accept that he must let his prized asset go.